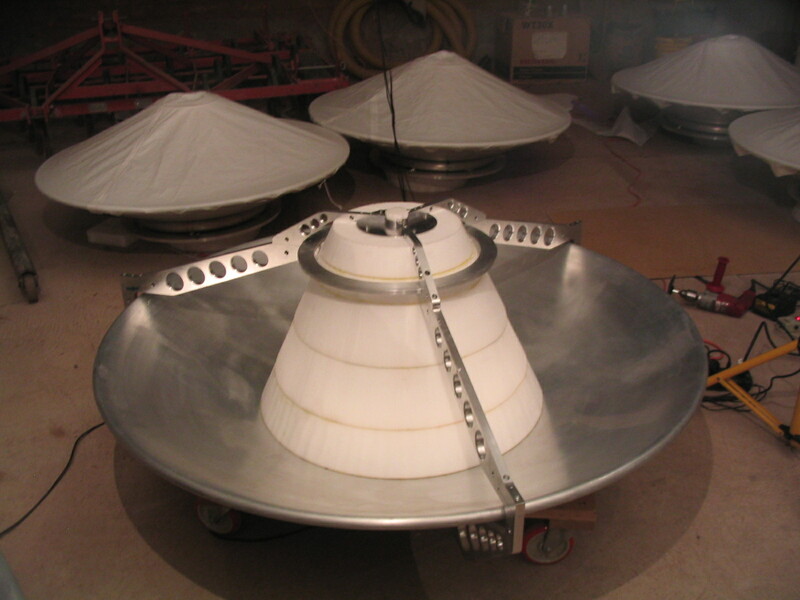 In 2006, the CBI was upgraded with new, larger antennas to increase sensitivity to small angular scales. 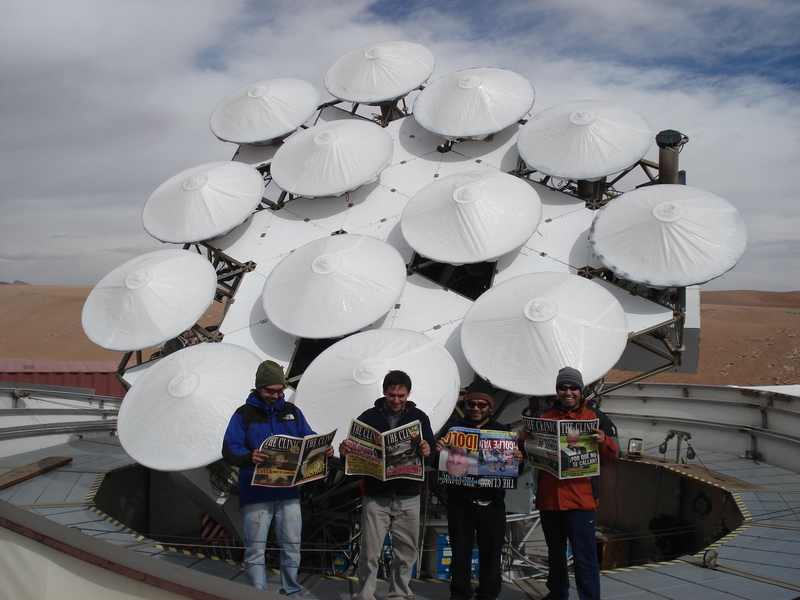 Design and installation of the new antennas was led by Mike Jones and Angela Taylor (Oxford University). 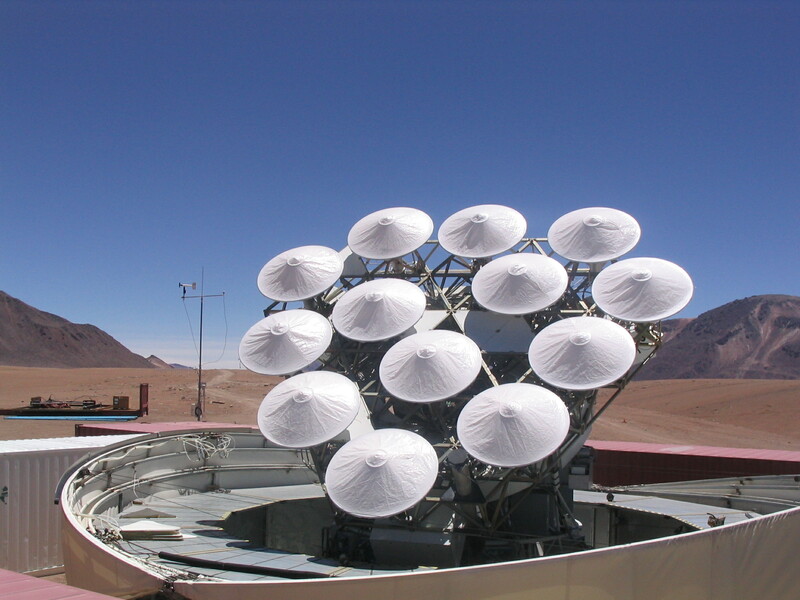 Observations were made in this CBI2 configuration between 2006 and June 2008, when the CBI interferometer was removed from the mount to make way for the QUIET experiment. The original antenna design for the CBI was an on-axis Cassegrain with a 0.9m, f0.33 primary, and a 155mm hyperboloidal secondary with eccentricity 1.41. The secondary is supported on an transparent polystyrene quadrupod, and the whole antenna enclosed in a can rising to 400mm above the rim of the primary. This can was designed to reduce the coupling from the secondary of one antenna to the feed of the adjacent antenna, and was measured to reduce such coupling from ~ -90 dB to ~ -120dB. The new design is intended to make maximum use of the physical area of the table. 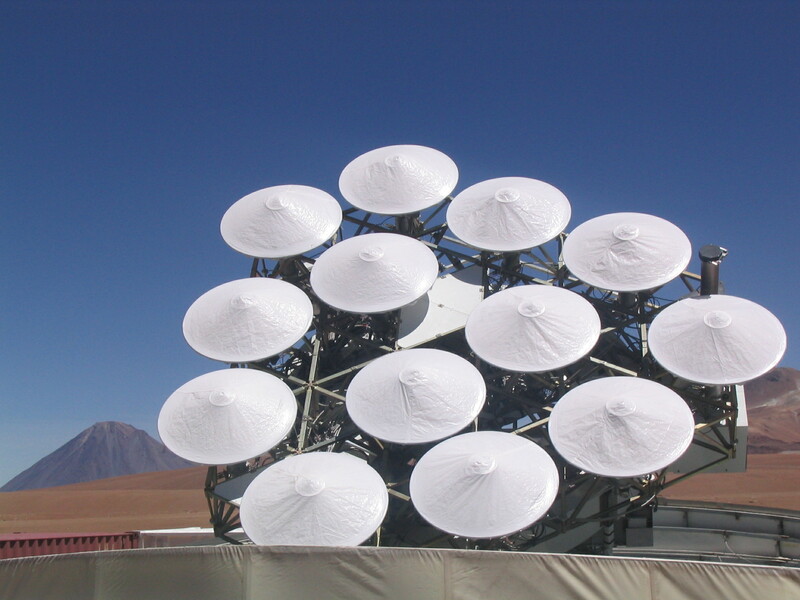 The largest antenna size that can be accommodated is 1.4m diameter. 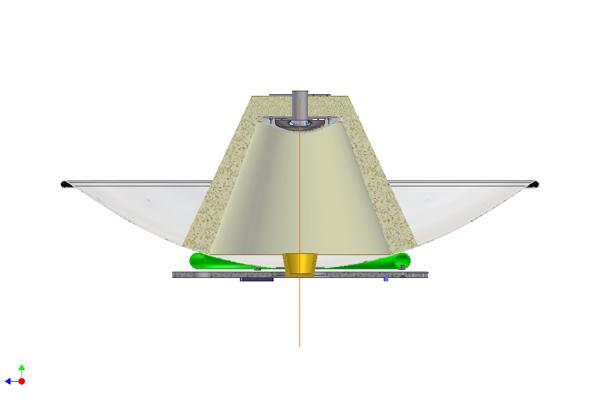 We based the design on a commercially available reflector with nominal diameter 1.37m and actual maximum diameter 1.41m (the difference is due to the roll-off of the surface at the rim). The focal length is 457.2mm, giving a very similar f-ratio to the original design. The reflector is fabricated by spinning, in which a circular aluminium sheet is pressed over a spinning mould with a roller. 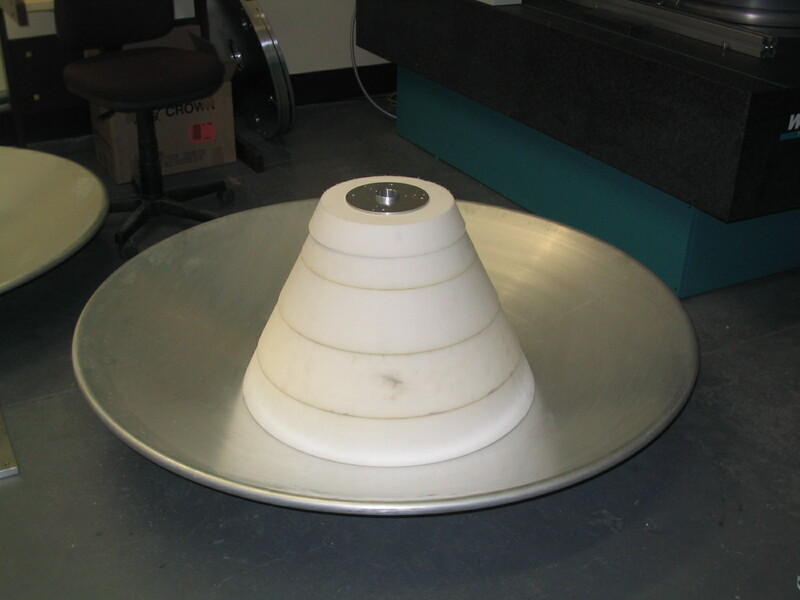 The surface is rolled over a circular tube at the rim, and there is also a circular tube riveted to the back of the dish at 300mm radius to provide a mounting point. This method is very quick and cheap, although obviously not as accurate as machining. The secondary mirror is held in place using a cone of LD45 plastezote expanded polyethylene foam. The mirror is held to a foam “lid” with a metal plate which screws in to the back of the mirror, and machined jigs are used to hold the mirror in place while the lid is glued to the cone. The CBI2 antennas on the platform. From left to right: Rodrigo Reeves, Ricardo Bustos, José Cortés and Cristóbal Jara. Antenna construction and alignment: a foam cone supports the secondary mirror.